Research from the last decades has revealed that many developmental and cellular processes show a striking degree of conservation throughout the animal kingdom from jellyfish to mammals. Findings from invertebrate model systems like the fruit fly Drosophila melanogaster can often be directly transferred to vertebrates including humans. How can one, however, reconcile the striking diversity of body plans with the existence of highly conserved developmental mechanisms? To address this question we study the evolution of developmental mechanisms. Our focus is dorsoventral (DV) axis formation, which has been extensively studied in the fruit fly Drosophila and encompasses one of the best-known gene regulatory networks (GNR). In Drosophila the DV axis is mostly patterned by a gradient of Toll signaling, a pathway which is not known for a patterning role in other animals, but rather for a highly conserved function in innate immunity. In contrast, the DV axis of other animals is established by a BMP signaling gradient, which in Drosophila has a more limited Toll-dependent function. In recent years our lab has shown that BMP signaling progressively replaces Toll signaling in insects which are members of more basal branches of the phylogenetic tree, like beetles, wasps and bugs. This work relates the derived mode of DV patterning in Drosophila to the more ancestral BMP-based mode found in other animals. Scanning electronmicroscopic picture (A) and nuclear staining (B) of the same gastrulating Tribolium castaneum embryo. As typical of the short germ type of development the embryo forms from a germ rudiment which occupies only a small portion of the egg surface the remainder giving rise to extraembryonic tissue (serosa). At this stage the embryo has only anlagen for the anteriormost segments. More posterior segments will form later from a growth zone. Interestingly, the greater influence of BMP signaling in basally branching insects is frequently linked to a high degree of pattern regulation not observed in Drosophila. For example, such insects can form two or more embryos within one egg. We are studying the molecular mechanism underlying this fascinating phenomenon and try to correlate the degree of pattern regulation with life history traits. We also analyze Toll-based innate immunity in basal insects as we assume that the patterning function of Toll was recruited from an ancestral function of Toll in protecting insect eggs against pathogens. These projects provide an ecological perspective to the evolution of development. Vesicular export of proteins from the endoplasmic reticulum is a highly conserved process in all eukaryotic cells. The efficiency of this process is often mediated by cargo receptors, which regulate uptake of cargo proteins into vesicles. 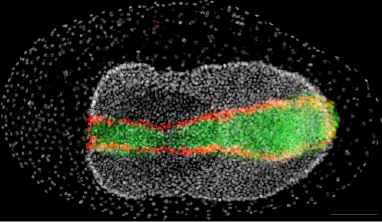 Drosophila Cornichon, for example, is the founding member of a conserved family of cargo receptors and has been our research interest due to its function in establishing the dorsoventral polarity in the oocyte. However more recently, vertebrate Cornichon proteins have been shown to be involved in the export of Glutamate receptors crucial for neuronal transmission in the brain, as well as G protein coupled receptors which also exert neuronal functions, raising the question: Do Drosophila Cornichon proteins possess neuronal functions via export of similar cargoes? To answer this question, we study the two fly cornichon genes: cornichon (cni) and cornichon-related (cnir). Strikingly, our investigations reveal that cnir mutant flies show behavioral alterations potentially associated with neuronal mis-regulation, hinting towards a functional conservation with its vertebrate counterparts. Currently, we employ genetic and biochemical means to support those observations and identify specific cargoes of both Drosophila Cornichon proteins.